Imagine it’s February and you’re wearing nothing heavier than a light coat. You’re walking on the cobblestone streets heading towards the Ponte Vecchio while eating the best gelato in the world and you have plans to travel to Spain the next weekend with your newfound friends. For me, I could never picture that being my life, especially in college. Before studying abroad, I was never a big traveler and had never left the country. I was born and raised in Connecticut, as well as attending UConn, so applying to study somewhere that was that far where people spoke an entirely different language seemed scary to me. After hearing my friends discuss the application process, I decided to join in and research. Soon after, I realized my interest was prominent enough to apply. The website made the checklist clear and manageable. As the application deadline came closer and I had officially applied, I became more and more eager to actually go. 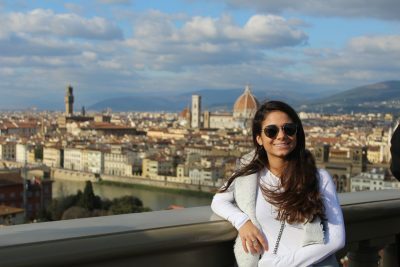 At that point I was unsure of what place was right for me but after speaking to the abroad advisors, I realized Florence, Italy was the perfect fit. I was drawn to how Florence was a city, but on a smaller scale. The history and unique culture made me feel like that place could be my home, all while learning about my family heritage. The city, people, and classes could not have done a better job of making that come true. A couple months later, I got off the plane and was in an entirely new country. The first week was a blur, exploring new sights and settling into my Italian apartment. Soon, once classes started, a more structured schedule helped me make the most of my time every day. In my semester there, I took four classes: Social Media, Italian, Intercultural Communication, and the Art of Buon Fresco. Luckily for me, two of my courses provided valuable knowledge in my future career as well as my major. Social Media took us step by step on how to create interesting, eye catching posts as well as how to build your audience reach. In that class, we took “field trips” and went to the major sites, such as the Boboli Garden, to take pictures for our Instagram account we created for the course. In Intercultural Communication, we discussed how important it is to be culturally sensitive and aware. Also, in that course, we interacted with students from the University of Florence regularly and discussed topics together such as stereotypes. For my Communication major, these courses helped me gain skills and perspective on what may be asked of me later on in my upcoming career. While those two helped me with my career path, all four guided me through the culture while I was there. Italian, of course, gave me the basic understanding of the language that I was able to speak, or at least try to, with the locals (which they greatly appreciated). Florence is known for their beautiful artwork around the city, thus why the Art of Buon Fresco provided me with insight and background of the famous works of art I was seeing every day. One of our lessons in that class was a trip to Palazzo Pitti. We walked through the palace’s historic rooms and discussed the fresco’s we saw, their techniques and meanings. After that class, places like Palazzo Pitti are no longer just beautiful pieces of architecture, they tell a story through the artwork within about what life was like during that time period. Without taking these classes, I would have never known about the culture and everyday life in another country the way I do now. Although my courses happened to teach me about subjects in my major, every course you take will still help you in the future. Think about it: you are in an entirely new country, whichever you choose, and you are in a classroom. The professor will be from that area and will be able to give you lessons from their local perspective. Already, you will begin to understand and learn what the people from that country think and think about. Also, once you live outside of the U.S. for a while, you are able to learn about an entirely new culture and find new ways to empathize with those not from your background. You are able to work on your ability to think bigger and outside of what you know. That alone will help you in the future. The independence, confidence and experience that you had there will follow you for a lifetime. I was hesitant about going at first; however, thankfully I made the right choice for me as I would never take that time back. I believe this was the best adventure for me to grow as a person thanks to my informative classes and open mind each day I was there. So with the application deadline approaching, my advice to you would be to research more about studying abroad. What could it mean for you? Where would be your perfect place? If you think this could be right for you, apply for this amazing opportunity! If you are even thinking about, or want to know more about study abroad, speak to your academic advisor as well as the abroad advisors! You never know if it’s right for you unless you try.